I did this walk on Sunday 28th October. I took the Metropolitan Line out to Amersham and made my way downhill to the main road to resume my walk along the South Bucks Way. Using my Oyster card it had only cost £3 to get to Amersham from Walthamstow which was remarkably good value considering on weekdays it costs £2.50 just to get to Kings Cross. 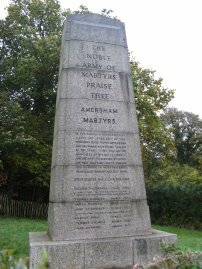 On my way down to Amersham Old town I passed a memorial to the Amersham Martyrs, photo 1, on the side of the hill. The memorial was erected in 1931 in memory of the martyrs who were Lollards, or Christian dissenters, who were burnt at the stake for their beliefs. A key part of their "heresey" appears to have been the use of an English translation of the bible. 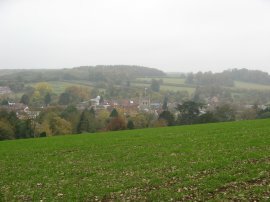 From the monument I continued downhill, over a field to the churchyard of St Mary's Church and on to the Broadway to rejoin the route of the South Bucks Way. On the way down the hill there were good views over Amersham Old Town, photo 2, back the way I had previously walked, and also down the valley in the direction I was going to head. 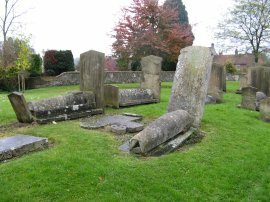 Passing through the churchyard there were a number of bedstead gravestones, photo 3. I turned left along the broadway and crossed over the end of Gore Hill opposite a large Tesco's supermarket and then took a driveway that runs just to the right of a small white painted cottage. 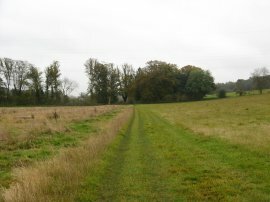 The route then follows the driveway for a short distance to the left as it heads out into open fields, photo 4, to join a footpath. 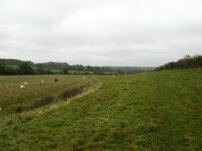 The route then followed a more or less straight course, running ahead over fields parallel with the River Misbourne, photo 5, along the edge of the fairly shallow Misbourne valley. 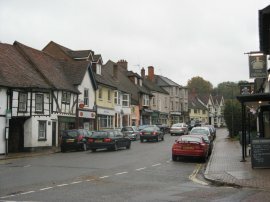 It was a very windy day and was drizzling when I arrived in Amersham and this soon turned into a steady persistent rain. After a while the route crosses a minor road and continues on under some electricity pylons and a little further on it was a relief to enter a small thin strip of woodland which provided shelter from both the wind and rain, the first part of the walk having been quite exposed. Passing through the woodland the route of the Chiltern Way once again joins the South Bucks Way and is followed until Chaltfont St Giles. 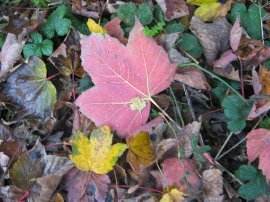 There were much many more leaves on the path, photo 6, than when I last walked two weeks ago with every gust of wind bringing more leaves down onto the ground. Leaving the trees the route reaches some houses and joins a tarmac road for about 50 yards before continuing ahead along a driveway past some houses and onto another footpath running between fields. This footpath soon runs along side another thin stretch of woodland which in turn soon leads to a driveway that runs past some very fine houses on the edge of Chalfont St Giles. 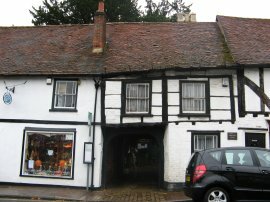 Reaching Chalfont St Giles, photo 7, the route heads across the road and under a building, photo 8, to a churchyard of the parish church, photo 9. Here the route follows the churchyard path around the right hand side of the church until reaching a small bridge where the route of South Bucks way turns a sharp right to run past the back of a small group of flats before then turning left to follow a tree lined path that leads out to fields, once again following the valley floor of the River Misbourne. This bit of the route was a bit unclear as it was not clearly signposted, and the route of the Chiltern Way which continues ahead over the bridge, was much clearer and seemed a more obvious way to go. 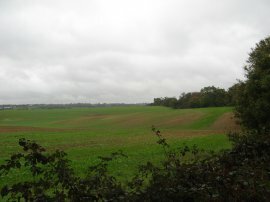 The route then heads across more fields, photo 10, towards Chalfont St Peter. It had briefly stopped raining as I passed through Chalfont St Giles but now the rain had started falling heavily and I was starting to get quite soggy. Reaching the edge of Chalfont St Peter the route passes a tennis court and heads to the right of Chalfont St Peter football ground before cutting across a car park to reach a church in the town centre. 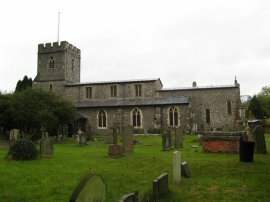 I went slighlty off course here, passing to the left of the football ground and heading alongside the dried up River Misbourne to reach the church. Crossing the road the by the church of St Peter the route heads up the High Street for a short distance before turning left onto Chiltern Hill, where the route takes a bridge over the A413 road. The route then continues ahead along the private road running through Chalfont Heights where after several miles of almost completely flat walking the route gradually starts heading uphill. At the top of the hill the route turns right along Upway to take a driveway that leads down to a path that runs alongside the edge of a field towards the trees of Hogtrough Wood where the route turns left following the edge of woodland. The path takes a wooden gate out of the field takes a fenced path that runs down between the grounds of the Chalfont Heights Scout Camp. 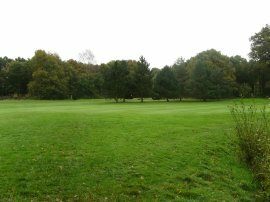 Leaving the grounds of the Scout Camp, the route then heads through Gerrards Cross Golf Club, photo 11, passing close to the 8th Tee and across the Ninth Green. Leaving the golf course the route turns right along Denham Lane. 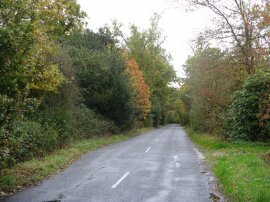 The route passes Mopes Farm then takes a path off to the left just before the entrance to Chalfont Lodge which is on the right of the road. For some time I have been hearing the noise from the traffic from the M25 and just before I turned off the road I got my first sight of the motorway. 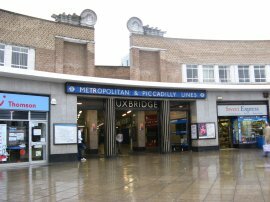 This footpath runs down to join a track that takes a large subway, photo 12, that runs underneath the motorway. 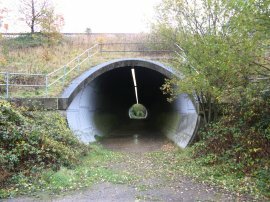 Having passed under the motorway the route continues ahead to join a hedge lined footpath that runs beneath trees. Approaching a cross road of paths the route turns right to follow a footpath that runs round the edge of a large field, photo 13, linking up with the route of the Shire Lane circular walk which I had walked some fifteen months ago. On my left there were views over the Colne Valley towards London. Reaching a road the route of the South Bucks Way turns right along Tilehouse Lane, photo 14. 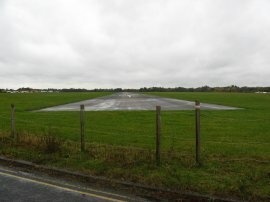 The route heads down this road for some distance, passing Wyatts Covert Camp Site, the Northmoor Hills Nature Reserve and the Denham Air Field, photo 15. A helpful sign at the end of the runway warned people not to park or stand under the runway so after taking my photo I moved swiftly on. There were a large number of planes on the airfield along with a few helicopters although there was no movement while I was walking by. Reaching Denham Green Lane the route then turns left and follows the lane downhill to reach the A412 North Orbital Road where the South Bucks Way heads straight across taking along Link Road that runs past houses and some flats on the right. The route crosses Moorfield Road and continues along Savay Lane for a short distance before taking a footpath off to the right. 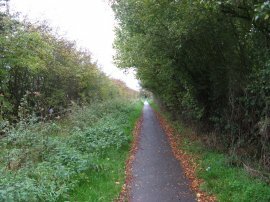 This tarmac footpath runs between gardens down towards Denham Station is known as "The Pyghtle" and is followed all the way to Denham Village. Having passed through a large bricklined subway under the railway lines by Denham Station the footpath, photo 16 continues ahead to join a narrow driveway that leads to Village Road, photo 17. 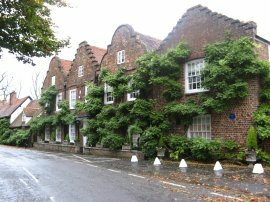 Here the route continues left along the road passing a number of fine old houses on the way, photo 18. 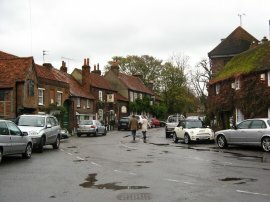 At the bend in the Village Road, by Mill Cottage, the route continues straight ahead into the grounds of Denham Country Park. 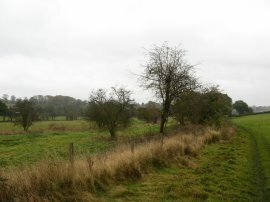 Here the route runs down beside Buckinghamshire Golf Course, for a little while following the course of the River Misbourne. Leaving the edge of the golf course the route passes the Denham Country Park visitor centre. I had a little look round the small visitor centre, which has toilets and a cafe, before continuing on following the South Bucks Way down through the grounds of the park, photo 19, to take a bridge over the River Colne. 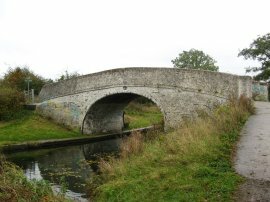 Once over the River Colne it was just a few yards further to the banks of the Grand Union Canal, photo 20. 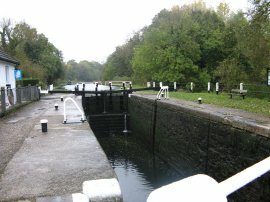 A few yards further upstream was Denham Lock, photo 21, which marked the end of the South Bucks Way. Reaching the lock I walked 11.9 miles for the day of which 10.9 miles had been along the South Bucks Way. Reaching Denham Lock I had linked up with the path of the London Loop which follows the opposite bank. From Denham Lock I headed back down the Grand Union Canal and took bridge 183 over the canal, photo 22, and followed a rather overgrown footpath that runs parallel to the A40. 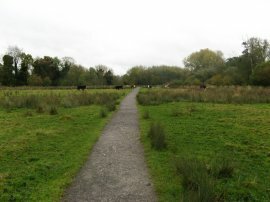 This path then passes under the road and taking a footpath that leads down to cross Shire Ditch and head up to a path that runs above the River Fray. Here I turned right and followed a path between trees to some houses at Braybourne Close where I was able to take a path that runs along the edge of the River into the centre of Uxbridge from where it was just a short walk up the High Street to the tube station, photo 23, for the train home . The total distance I had walked at the end of the day was 13.3 miles. 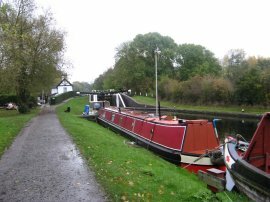 It has been pleasant walking down to Denham Lock although I had not enjoyed this section as much as the first part I had walked between Wendover and Amersham. The scenery was less impressive and the walk was not helped by the dark grey clouds and wet weather that had lasted through out the day. My GPS made the total length of the South Bucks Way 21.6 miles although the published length is 23 miles and the difference is probably down to my GPS which always seems to under estimate the distance walked when compared to published mileages.